Today you can get a free Kindle ebook download from Amazon. The “37 Gift Jar Recipes: Soups” is free today and is usually $0.99. 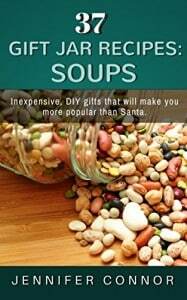 This book has some great Christmas gift ideas if you are interested in getting crafty. Ebook reminder: This book was free at time of posting (December 16th, 2014) But, you should check the price before hitting the 1-Click button. You don’t need a Kindle device to read this book. You can download a free Kindle reading app to your PC, Mac, phone or tablet. You may also be able to read this book on your browser through the Kindle cloud service.